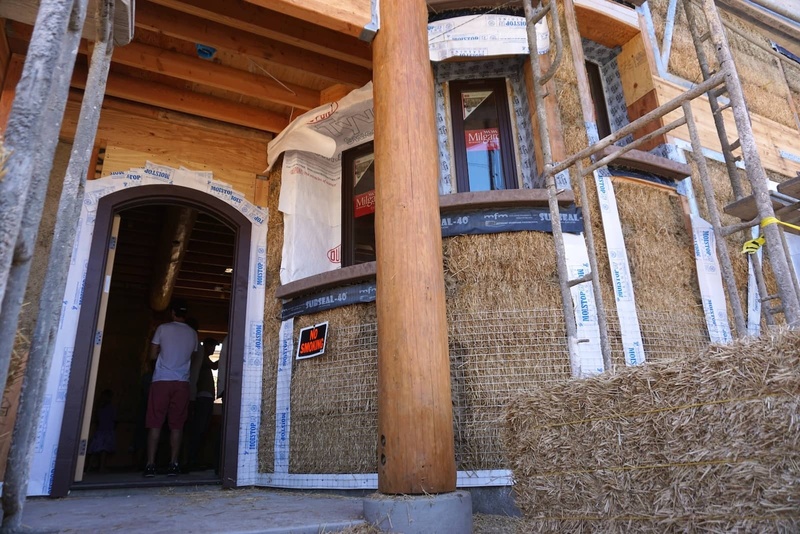 Straw Bale Home Construction and Passive Rainwater Harvesting Coverage in Edible San Diego! 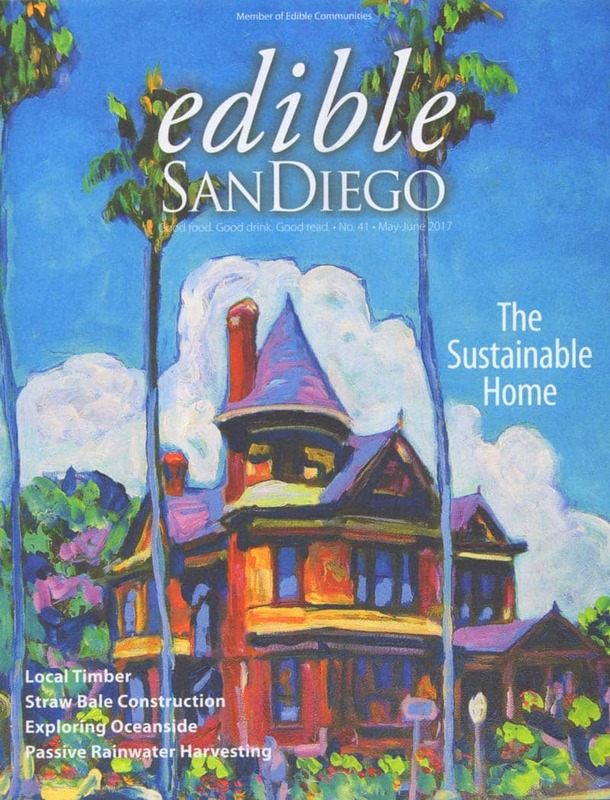 We are big fans of the local San Diego magazine, Edible San Diego, so you can imagine our appreciation and excitement when they called to do a story on passive rainwater harvesting and how we apply it in our landscape designs and installs. What we didn't know was they were also covering straw bale construction, a natural building technique where insulation and mass are of a home are mostly taken up by bound and secured straw bales. And, they not only covered a building technique that we are huge proponents of, but they featured two of our close friends and peers, Mike and Rebecca of Simple Construct who design and build natural, healthy homes. 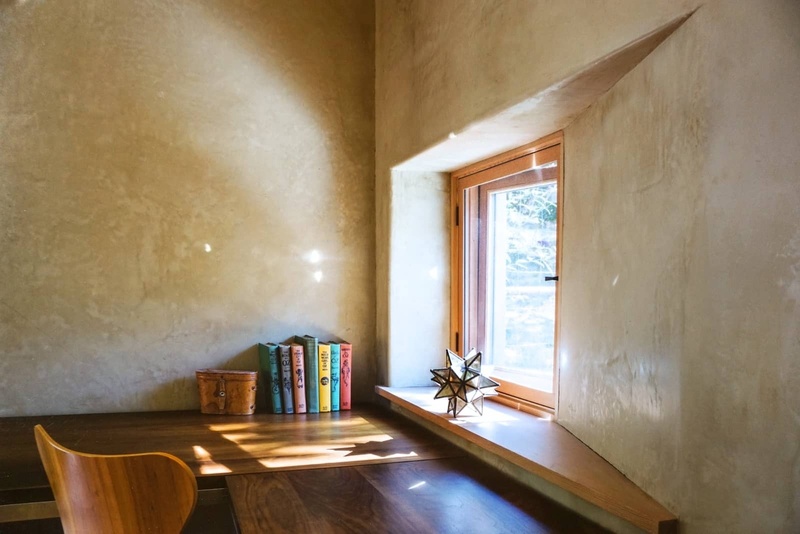 This is the finished look of a natural plaster, straw bale interior. Warm, comfortable and inviting. The reason we love straw bale is that it takes what is normally seen as a cheap byproduct of producing grain. Normally, straw bales are used for animal bedding, light garden mulch, or pumpkin patches and fall events. But, straw bales—when twined, dried and correctly protected from moisture intrusion—are useful building blocks for structures and homes. Mike and Rebecca are experienced and skilled artists that have helped push awareness for straw bale construction and other natural building methods here in San Diego County. We've enjoyed many tours of their homes, both during construction as volunteers and as comfortable guests once completed. A straw bale home Simple Construct sub-contracted for in Encinitas. Straw bale homes are quiet and stay comfortable, even in the peaks of winter and summer. Heating and cooling a straw bale home takes very little energy due to the high insulation value of the bales. They act as giant insulation blocks that reduce external noise intrusion as well as energy loss. The natural component is also a big bonus. The material is relatively inexpensive, it is considered a waste product by many who produce it, and it has no toxic off gassing or construction byproducts (outside of the exhaust produced in harvesting, baling, and transport). 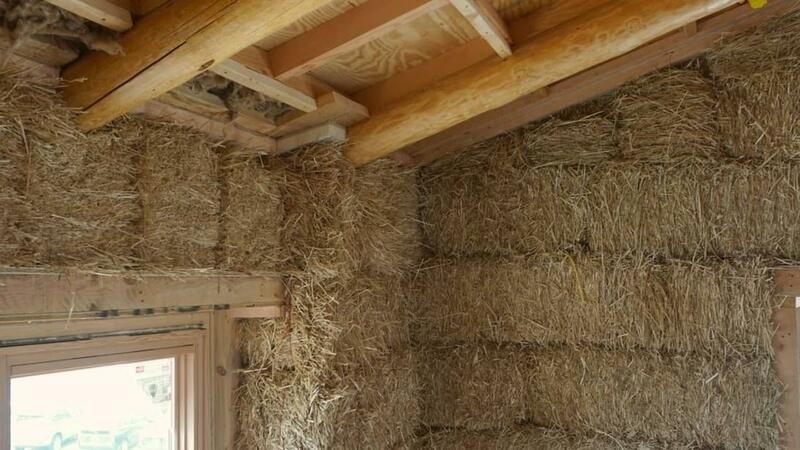 Walls are thicker in straw bale homes. With the thickness niches and window benches can be utilized. Straw bale homes require a breathable layer of protection, and this is most commonly done with natural plasters. Natural plaster, as opposed to cement based plasters like stucco, allow moisture and air to pass through microscopic pores. This allows the wall to breathe and helps migrate moisture out of the structure. A big benefit of the natural factor of plasters and pigments is there is zero dangerous off gassing. Not to mention the cool touch and earthy, grounded feel of the final product. 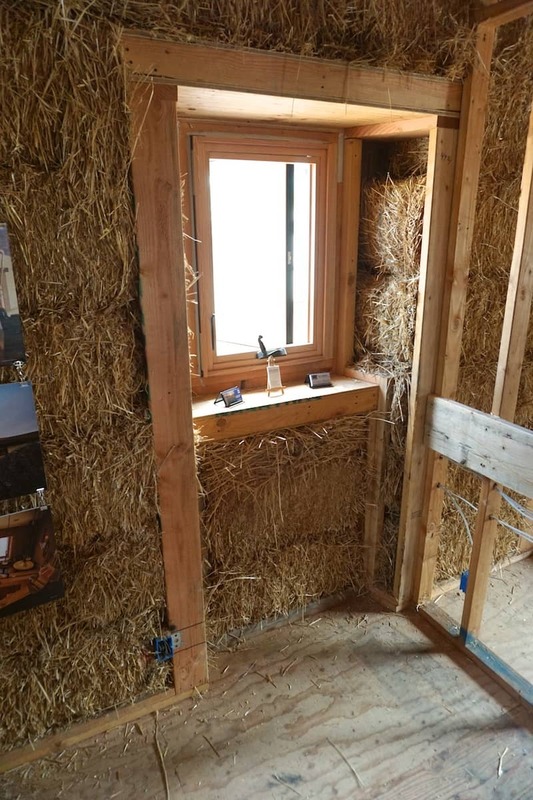 If you're considering building a new home or structure (or even renovating an existing structure), give Mike and Rebecca a call to discuss how straw bale might work for your home. Many times, in our technology-focused culture, we over complicate things or let the technology dictate solutions. One of those areas where we've over complicated things is: rainwater or stormwater. Many street gutters quickly carry away precious rain. This once clean, distilled rain now contains sediment, pollutants and trash which harm our waterways and oceans. As a county that averages about 10-30" of rain, depending on which microclimate you live in, you'd think we'd appreciate rain and catch as much of it as we can. Unfortunately, with the bygone eras of cheap water, lower population densities, and calmer weather extremes, we let technology lead us into a bit of a pinch. Instead of capturing water where it lands, say on roofs, driveways and roads, and then directing that water into holding tanks or on-contour ditches and ponds to allow the water to recharge aquifers, we've created hardscapes that shunt water away, as fast as possible. While some soils may need to be starved of water due to liquefaction, most soils, when properly cared for and planted, can absorb up to 4" of water per foot before becoming saturated. So, we take water that's imported from Northern California and the Colorado River, use tons of technology and power to move it to our homes, yet take clean, free, seasonal rainwater and allow it to be sent to the rivers and oceans as fast as possible. This does not make sense! 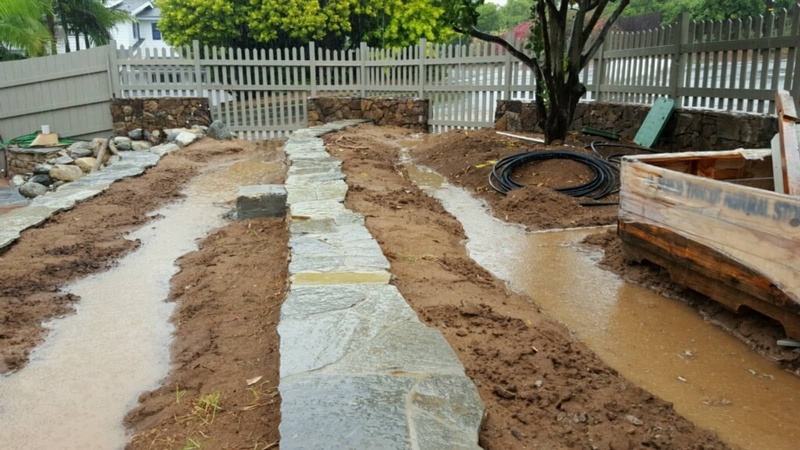 That's why we do the work in creating passive rainwater harvesting features in our landscape designs and installs. An Encinitas landscape install featuring passive rainwater harvesting. This is taken during installation and a fall rain event. Instead of sending all this water directly to the ocean, we allowed it to sink in and hydrate the thirsty landscape. The same terraced, passive rainwater features mulched and planted up. Now, water that once ran to the ocean is utilized on site and reduces irrigation water needs. 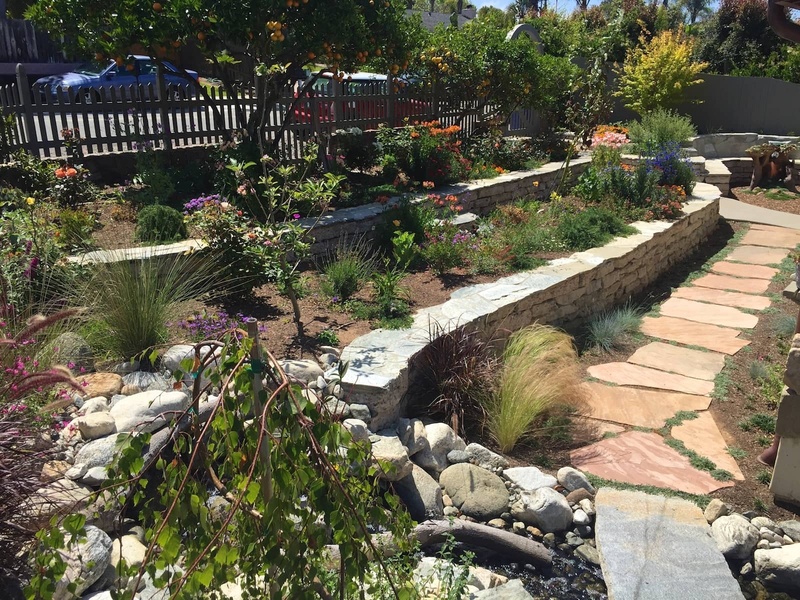 Combining native plants or other drought tolerant plants with landscape features such as mulched basins, on-contour swales and greywater reuse irrigation systems, we can easily reduce the water demands of our homes and reduce our demand for imported water. Some San Diego County homes spend up to 75% of their monthly water bill on irrigation! Thankfully, our work, the work of other like-minded contractors like Catching H2O, et al. is catching the attention of city planners, residents and publishers like Edible San Diego. The changes we need to see won't happen over night. But, straw bale by infiltration basin, we'll be able to meet our county's climate goals and create a greener, more healthy San Diego. A Poway, CA landscape that now passively harvests roof rainwater to help irrigate the front yard. You can do this too! Call us to schedule an appointment.